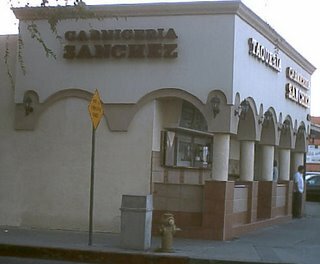 Taqueria Sanchez is a popular taco destination for westsiders. Two locations less than a mile apart from each other serve up cheap tasty mexican food for the people. The Centinela location has an indoor seating area and a salsa bar while the Inglewood blvd location has a taco window to compliment the carniceria and mercado. 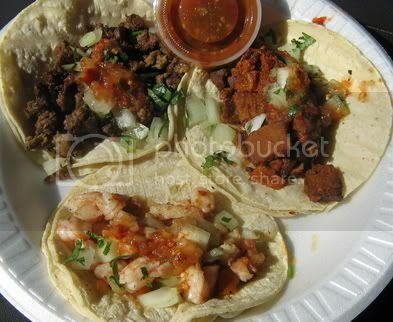 I was at the Inglewood location buying some carne asada and decided to have a few tacos. I've heard Taqueria Sanchez described as the best taqueria on the westside but they'd have to go a long way to replace tacos por favor and Don Felix as my local taqueria of choice. I ordered asada, al pastor and shrimp tacos and by the time I was done paying for the carne asada and a lime jarritos inside the market my tacos were ready. The first thing you need to know is that the salsa roja may look harmless but it has some kick to it. So if you are one that likes a mild salsa I suggest asking for a verde. I like my salsa to make me sweat a little and reach for my lime jarritos so I poured the salsa liberally over my tacos. I tackled the shrimp first. The shrimp was sauteed with a subtle garlic flavor. It didn't overwhelm me and there was no taste explosion but I'm partial to crispy shrimp tacos anyway. No complaints here though, at $1.50 each the shrimp tacos are a deal. The asada is unique at Taqueria Sanchez in that it is baked not grilled or braised. The end result is toasty charred bits of beef with an extra beefy aftertaste. The first time I had the their asada I was put off by the method but it's grown on me and I quite enjoy it now. The al pastor is also prepared differently. There is a heavy dry rub of seasoning on the chunks of pork. This is not your standard al pastor and I'm not even sure it should be called al pastor but I liked it. It was different and the heavy chunks of pork packed alot of flavor. 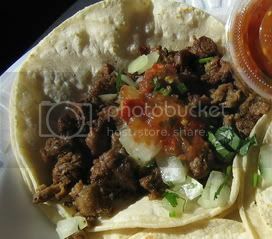 Overall a good taco experience and the market at Taqueria Sanchez is a must for all westsiders. Fresh salsas and carnes that locals line up for make this taqueria a local institution. I ate dinner tonight at the Centinela (sit-down/salsa bar) location. That's some good pastor--and it was plenty saucy, I thought. One strange thing, though: they put lettuce in a pastor burrito! i'll have to try an al pastor burrito from there. The pastor is different but it's good and it would be interesting to see how it goes with rice and beans. i'll tell them to hold the lettuce though..lettuce has no place inside a burrito! It may have been cabbage, which has an esteemed and honored place within burritos de pescado, but is still unacceptable when swine is the meat at hand. Taco fans please note that the Centinela location is a few blocks away on the west side of the street south of Washington (or was it Culver?) with plentiful parking in the back and a well-lit area with two rooms and plenty of tables. Tacos there are $1.18, except the shrimp at $1.50. The shrimp are the tiny itty-bitty salad type, but not overcooked and thus moist and tasty. The salsa bar had two red sauces, one a bit hotter than the other, as well as a green and a pico de gallo. For those non-purists who may consider a burrito, as I did to bring home, beware that the signs serving as menus list burritos as having meat, onion, and cilantro -- not listing the rice or dreaded beans (for me) which luckily I asked to have excluded. No mention of lettuce or cabbage either, which didn't make an appearance in my al pastor. The place was very bright, clean, and the staff very friendly. do they have a pillow with a taco on it? The baking method to which you refer is called adovada, as in carne adovada. When I moved out here it was disappointing that noone out here but me cooks it that way. I do love asada to be sure but there's nothing quite like a slow red chile bake. The finest adovada I've ever had is in a place in Albuquerque called Barella's. I just had myself some pastor from the Centinela location, making sure to say "SIN LECHUGA!" at the counter, and DAMN was it good. They have two salsas rojas. One is kinda weak; the other is mindblowingly hot. A fingertip dab of the latter produced the definite sensation of my throat closing up. Pretty awesome. 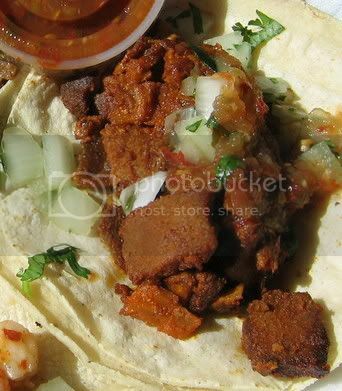 The al pastor tastes like chinese pork sausage called Cha Shu which is mixed with a 5 star spice rub. The tacos are ok (carne asada and al pastor). I give them 3 out of 5 stars. The red salsa is pretty hot so I stick with the verde.